Welcome your Thanksgiving guests will a beautiful home. Whether you are a seasoned Thanksgiving host or just preparing for your first Thanksgiving as a family, preparing your home for the influx of hungry and excited guests is no easy task. 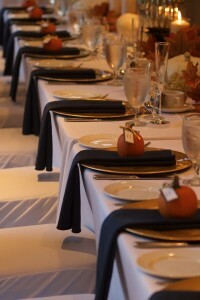 Here are some of the best simple ways to get your home ready for Thanksgiving guests this week. If you want to spice up your interior without making a huge change, adding a wallpaper accent wall is a great way to do so. You can choose a basic bold solid or get quirky with fun patterns and designs. A beautiful floral wallpaper is a great backdrop for Thanksgiving and spring holidays like Easter. For a more rustic vibe, get wallpaper that mimics other natural materials like brick, stone, or wood paneling. These natural materials bring an added warmth to your space and will look great around the Thanksgiving dinner table. Fall window treatments are a fun way to celebrate the season and get your guests excited for Thanksgiving. Choose a color palette that reflects the warmth and comfort of late fall, like rich warm browns, deep romantic reds, and spicy rust oranges. Consider incorporating window treatments that take advantage of the limited natural light available as days get shorter and nights get longer. Add candles or softly lit floral arrangements to the areas around your windows for Thanksgiving guests to enjoy the beauty of your home and be able to see their dinner.